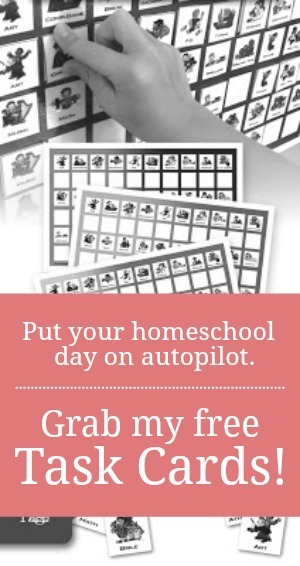 Morning Time is definitely a current buzzword in homeschooling circles. With the popularity of the Your Morning Basket podcast, it seems that everyone has caught the fever. And why not? A purposeful time together each morning pouring over Truth, beauty, and all that is good should be an anchor in the homeschool day. Looking back, I can honestly say that I've held fast to those two goals. In truth, if nothing else gets accomplished in our day but our morning time together, I still consider the day a success, because I know that I've aligned our morning to my priorities. So while I hold nature study, art history, and math practice in high regard, I don't ever peg them in my basket. I choose to simplify. To edit. To order a simple morning time so that our focus will be just that...FOCUSED. Here's a peek into my basket, a look at my morning time binder, and a discussion of some common FAQs for planning morning time. 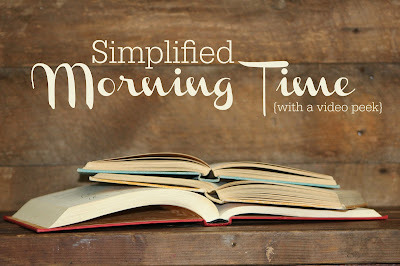 Morning time doesn't have to be complicated. It doesn't have to be busy. Ask yourself WHY and let your answer guide you. Keep it simple. Keep it focused. Thanks for sharing! I loved seeing inside your notebook. My oldest is three and we started doing a simple morning basket a few months ago. Other preschool things that I had wanted to get to at other times of the day went by the wayside when I became pregnant with my third, but we have kept up our morning time (most days). Right now we just read from a story Bible, work on a weekly memory verse, learn a new question each week from First Catechism (Protestant), read nursery rhymes, and learn a song or fingerplay. Of course as he gets older I'll want to add more, so thank you for the wonderful ideas! That sounds like a wonderful preschool time!! Way to go momma for paring down to simple. I did morning time for a couple of months with my 5yo, 4yo, and 2yo. It consisted daily of a short poem or fingerplay, one new sign (the older two were obsessing over my sign language book), an action song (such as ring-around-the-rosies), some read-aloud, and drawing/coloring (occasionally we used draw-write-now, but mostly they just played around with coloring books or blank paper). We're starting again Monday, and it will look mostly the same, with a few tweaks. I'm adding a bible story and removing the sign language (nobody is interested any more). And I'm toying with the idea of guiding them each in a "notebook page" (with any info I deem appropriate for the day :-)). That might take over the time we'd previously spent on drawing/coloring. I loved watching/reading about your morning time. My biggest takeaway is that you start morning time off with the same song every morning to help call everyone in. I'm totally planning on using that idea now! Thank you for sharing about your use of the Morning Basket! I now have a better vision and we enjoyed our first morning. Thanks for...re-posting it! I read this post past august. It helped me to pare down my morning time a lot. I was about to drop in the morning time's wave and do too much. My kids are little; 8yo, 5 yo and 15 months. Even I try to do less, the less is still a bit too much I think. I do bible each day and almost read aloud each day, even if it is for 15 min. I have to rotate the rest. I can't do bible, read aloud, goos manners, poetry and hymnes each morning! Just to subject and the 15 minutes is done. We read aloud during the snack time, so I don't really count it in my morning time. We do our family devotion in the morning during breakfast, and my husband read story bible at night. When I do Bible time, it is more books like: How people lived in the Bible time or What's the Bible. Mayby I still do too much. I'm curious to know how you did morning time with your kids at that age. It will inspire me! Thanks Jamie! At that age, Nancy, it was very simple. A song or two, a Bible story, and maybe a quick memory verse practice. That was it. There's time enough someday to do all the rest. It sounds like you've got a great plan!